Growing your own food gives you total control over the process from start to finish. You rely only on yourself for everything from the types of nutrients in the soil to keeping the produce organic and chemical free. About 35 percent of American households grow their own food at home or participate in a community garden. One of the most significant problems these gardeners face is an inability to grow vegetables year-round. In areas where the winters are cold, it’s nearly impossible to produce anything outside during the coldest months. 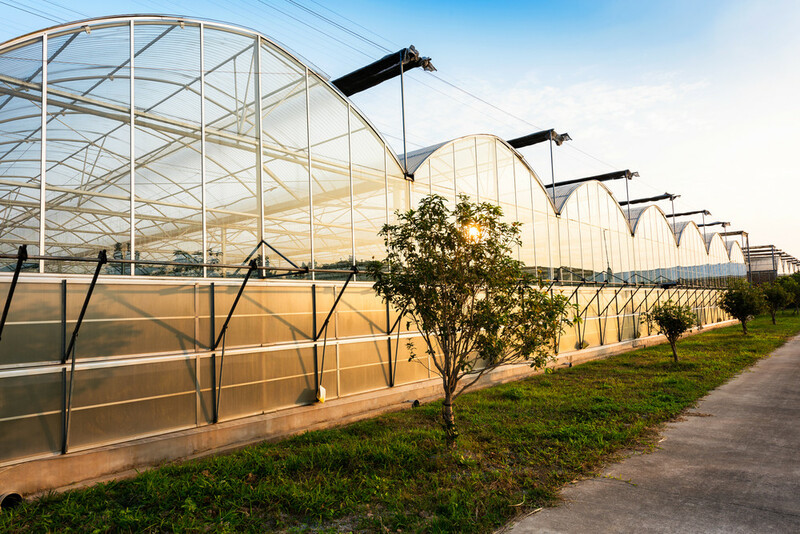 One solution is building a greenhouse so you have a mix of starter plants for when growing season arrives and a warm, moist environment for year-round plant growing. First, choose a location for your greenhouse. The greenhouse needs to have full sunlight but also be close enough to your home to run a power cord to it. The area should also have good drainage. 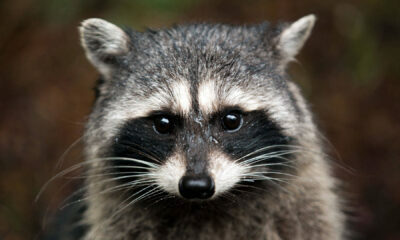 You don’t want mold in your greenhouse or mud surrounding the entry. You have several options for your greenhouse — four seasons, unheated and cold frames. A four-seasons greenhouse allows for a warm, moist environment over winter where you can grow tomatoes and greens. An unheated greenhouse may keep things just warm enough to produce some winter crops, such as lettuce. A cold-frame works best to get an early start on the growing season and keep the frost off your plants. For your design, you can choose a dome structure, a triangular frame or a standard building with a peaked roofover. Choose the style that fits best with your house and the space you have available. 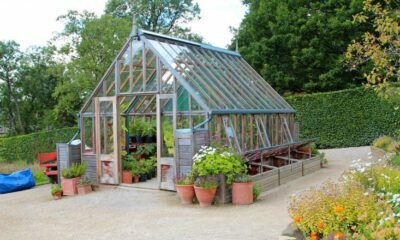 Once you choose the type of DIY greenhouse you want, either find free plans online or draw up your plans. A cold frame can be as simple as two old window frames with the glass intact placed together in a teepee. You can also sketch out a plan for your greenhouse on graph paper. Keep in mind the location you chose and how much space you have to work with. You’ll also need to think through how large of a greenhouse you want. If you’re only growing a few plants for two people, you don’t need as much as if you’re growing vegetables for a family of 10. Buying a greenhouse package is expensive. However, you likely have items you can use lying around or can gather some reclaimed items fairly cheaply. Check out local salvage yards for old windows, for example. You can also use heavy duty plastic instead of glass to save money. While it isn’t as durable, and you’ll need to replace it occasionally, upfront it’s a much cheaper solution than a glass greenhouse. Tell everyone you know about your project and ask if they have old windows or scrap lumber they’d like to donate. Check sites such as local Facebook classifieds and Craigslist for discounted materials. People sometimes have material left over and sell it for a fraction of the cost of buying new. 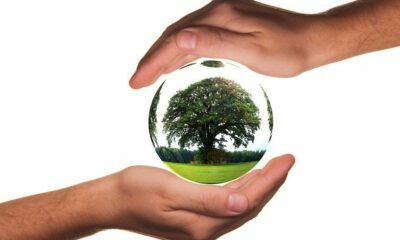 Save money any way you can on materials for the least expensive greenhouse possible. Measure and build the sides of your greenhouse according to the plan you’ve chosen. If you select a dome structure, you’ll work with rebar and hoops instead, but for a more traditional square or rectangle building, you’ll need to build the sides. Once you have the sides constructed, raise them into their permanent location and secure them together. For a more permanent structure, you may want to lay concrete footers to secure the frame. Add the door and roof beams. Next, stretch the plastic from top to bottom, securing it at crucial points along the way. How you accomplish this varies by the plan you’ve chosen. If you’re building a dome structure, you’ll start from one side on the bottom, stretch a long roll of plastic up and over the dome and secure it on the other side’s base. You will need ingenuity and a little building knowledge to create your own DIY plan. If you aren’t sure how to put a basic structure together, study YouTube videos or ask for help from someone with construction experience. Once the greenhouse is up and sealed with plastic or glass, go ahead and start on the interior. You can put shelves or raised beds down either side, create a U-shape or add another row down the center if you have space. Look at the layout you have and draw out some ideas. Make sure you allow enough room to reach all your plants efficiently. Think about what you’d like the interior of your greenhouse to look like. Do you want rows on the outside and a row down the center? The ground adds some moisture to your greenhouse, so you won’t want to cover every inch of it. Some people add pea gravel or stones both for easier walking through the greenhouse and for additional heat during the colder months as the rocks can hold heat. If you did a U-shaped layout, you might leave earth under the shelves or raised beds and place stone in the walking areas. If you want your greenhouse to be a true four seasons greenhouse, during the coldest weather, run an extension cord and add a space heater to your greenhouse to keep your plants toasty. Set the heater on the ground so the heat rises to the top of the greenhouse and it maintains a steadier temperature. 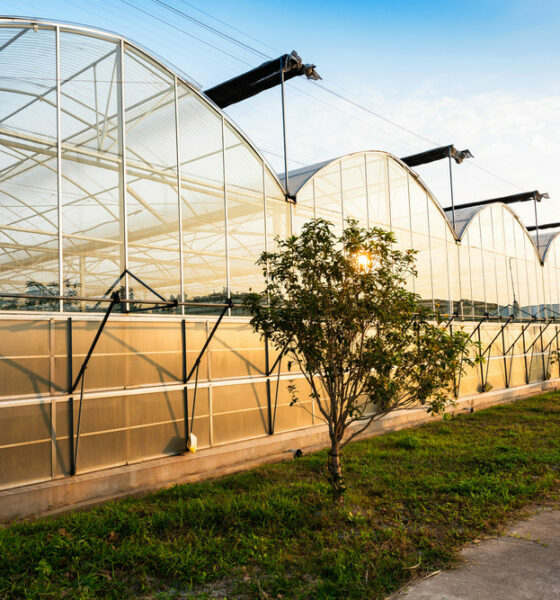 A greenhouse you build on your own doesn’t have to be as complicated as the ones commercial growers use. You don’t necessarily need pulley systems and complicated glass panels. Building a simpler, DIY greenhouse can save you money while still enabling you to growing your own vegetables all year round. Kayla Matthews is a green tech and smart energy writer. Her work has appeared on VICE, Electrical Contractor Mag., The Week and others.